The 2019 Buick LaCrosse is one of the car market's hidden jewels. Drivers will enjoy this American luxury sedan's sporty handling and premium interior. Buick's reputation for building dependable automobiles makes the new LaCrosse an even more fulfilling choice. It's perfect for the folks who're looking to upgrade from a regular family sedan. Let's find out if the new LaCrosse is the right option for you. Buick made a few updates to the LaCrosse lineup. The new Sport Touring model will intrigue drivers who are seeking more flair. Meanwhile, an air ionizer has been added to the Avenir model's list of standard equipment. Buick has priced the base LaCrosse at less than $30,000. This is a sweet deal for such a great all-around car. It's literally thousands of dollars less than a new Mercedes-Benz C-Class. Fortunately, you can still look forward to enjoying a luxurious ride. Some of the noteworthy standard features include automatic xenon headlamps, a 4G LTE Wi-Fi hotspot, and an 8.0-inch touch screen. Buick's innovative eAssist four-cylinder engine comes standard on the new LaCrosse. A mild hybrid setup helps it to return great fuel economy. According to the EPA, you can anticipate getting a combined 29 mpg on regular unleaded gas. Although the four-cylinder LaCrosse isn't a powerhouse, its 194-horsepower output will get the job done. Because of the LaCrosse's good amount of low-end torque, it's able to offer surprisingly strong acceleration from a stop. While the base engine will deliver the most fuel savings, some drivers will not be able to go without the meaty V6. Buick tuned it to push out more than 300 horsepower and 282 pound-feet of torque. This is enough muscle to push you back into your seat. The V6-equipped LaCrosse recorded a brisk 0-60 time of 5.6 seconds. Even more fulfilling is the V6's fuel economy. When cruising along at highway speeds, you should be able to average up to 30 mpg. This car's tight handling may surprise you. Although the 2019 Buick LaCrosse isn't billed as a sports sedan, it feels incredibly nimble. Even when driving around curves, there’s not much body roll. 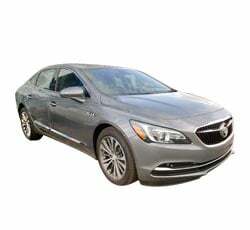 Ride comfort is also a strong suit for the new Buick LaCrosse. If you demand the best possible handling, opt for the Dynamic Drive package. Active suspension dampers and upgraded tires enable the LaCrosse to carve corners with more precision. In the past, Buick became known as a car company that appealed to older drivers. However, the 2019 Buick LaCrosse proves that's no longer the case. Curvaceous body lines and a low stance help give the LaCrosse a commanding road presence. HID headlamps are found on every trim. A lot of people will likely be interested in the all-new Sport Touring model. It comes outfitted with a number of sporty touches, including a mesh grille and a stylish rear spoiler. Expect the 2019 Buick LaCrosse to deliver a very relaxing ride. There's plenty of space for everyone in your family. Impressive legroom in the back makes the Lacrosse a great choice for tall families. Drivers of all sizes will enjoy the front seat's contoured design. Massaging and ventilated front seats are available on the upper trim levels. An available air ionizer adds to the sedan's comfort. By removing dust and other particles for the air, it helps passengers to breathe a bit easier. All versions of the 2019 Buick LaCrosse come standard with a Teen Driver system. This technology is a huge stress reliever for the parents who'll be sharing their car with a teenager. You can use the system to restrict the car's top speed and automatically turn on driving aids such as forward collision warning. Teen Driver also compiles a report of your teenager's driving habits, which can be sent directly to your smartphone. Buick's IntelliLink interface has steadily improved over the years. Drivers will be able to easily place hands-free calls and stream music. If you happen to receive a test message, the system can read it aloud. Apple CarPlay and Android Auto make the process of linking your smartphone a lot easier. Some trims feature built-in navigation as well. When facing bad weather, the LaCrosse’s optional all-wheel-drive system will help you to overcome the slippery conditions. An active twin clutch maximizes traction by routing more power to the appropriate wheels. You can also take advantage of the AWD-equipped LaCrosse’s improved handling on dry pavement. However, keep in mind that all-wheel drive is only offered with the V6 engine. The 2019 Buick LaCrosse was able to earn a perfect overall safety rating. It also received a “Superior” rating from the IIHS for its excellent front crash prevention. Adaptive cruise control and forward automatic braking are available on the top trims. An automated parking system also comes with the Driver Confidence II package, which guides you into tight spots. The eAssist hybrid engine does a good job of promoting good fuel economy. However, it may not be potent enough for some drivers. While you’ll experience no problems climbing steep hills and merging onto busy highways, don’t expect to be blown away by the sedan’s power. Drivers who have a thirst for performance should choose the 310-horsepower V6. Most automotive gurus consider the 2019 Buick LaCrosse to be a great deal. Nevertheless, the more luxurious Avenir model is a bit pricey. Anticipate shelling out more than $44,000. On the bright side, you will be surrounded by a number of premium upgrades. Some of the top-shelf features include upgraded leather, massaging front seats, and a Bose surround-sound audio system. Although the 2019 Buick LaCrosse comes well equipped, some of the sedan’s safety features will cost you extra money. For example, only the Premium and Avenir trims can be equipped with automatic emergency braking. Non-luxury sedans, such as the Toyota Camry and the Honda Accord, come standard with this popular safety technology. Adaptive cruise control and pedestrian detection are also limited to the top trims. A vibrating Safety Alert seat is available for the 2019 Buick LaCrosse. Unfortunately, it tends to react prematurely at times. Meanwhile, the sedan’s lane-keep assist system doesn’t do a great job of smoothly steering drivers back into their lane. Some people will likely keep these safety systems turned off. The typical family will have no issues with the LaCrosse’s available trunk space. On the other hand, some folks will desire just a bit more cargo space. When taking an out-of-town trip, you may have to leave your extra travel bags at home. By comparison, there’s an impressive 18.8 cubic feet of space in the 2019 Chevrolet Impala’s trunk. When shopping for a large sedan, you may also consider getting the 2019 Chevrolet Impala. While the Impala is spacious and comfortable, the 2019 Buick LaCrosse will deliver a more luxurious ride. You can also take advantage of the LaCrosse’s eAssist engine, which returns much better fuel economy. The 2019 Nissan Maxima is another car worth considering. Although the Maxima is sportier than the Buick LaCrosse, it doesn’t provide as much legroom for your backseat passengers. When comparing the LaCrosse to the new Toyota Avalon, you’ll notice the Avalon’s higher price tag. Its starting MSRP is almost $6,000 more expensive. The 2019 Buick LaCrosse is a strong value that you won’t regret buying. It matches the luxuriousness of sedans that demand a lot more money. While the base eAssist engine is smooth and efficient, choosing the V6 engine transforms the 2019 Buick LaCrosse into a more exciting vehicle to drive. If you desire safety technologies like automatic braking and adaptive cruise control, they’re only available on the more expensive LaCrosse trims. • Why Buy a 2019 Buick Cascada? • Why Buy a 2019 Buick Enclave? • Why Buy a 2019 Buick Encore? • Why Buy a 2019 Buick Envision? • Why Buy a 2019 Buick LaCrosse? • Why Buy a 2019 Buick Regal?